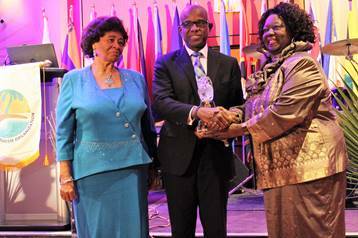 The Caribbean Tourism Organisation (CTO) has bestowed its most prestigious honour on social advocate Jean Augustine. The Grenada-born retired Canadian school teacher and politician was given the CTO Lifetime Achievement Award — the first person ever to be given this award in Canada — at a glitzy Caribbean Ball in Toronto on Friday (10 November) evening. Augustine was a trailblazing politician and social activist, having worked her way from a nanny when she first arrived in 1960, to become the most powerful black woman in the Canadian parliament. She was the first black woman elected to the Canadian parliament and the first black cabinet minister, acting as Prime Minister Jean Chrétien’s trusted voice on committees and at international meetings, and in Parliament when he was absent from the House of Commons. During her acceptance speech, Augustine described how she once persuaded the Canadian prime minister to meet Caribbean leaders in the region instead of having them travel to Canada. That meeting was held in her country of birth, Grenada. She also described her battle to get the government to ease visa restrictions on Caribbean nationals, a battle she said she lost. Prior to serving in parliament Augustine was a school teacher, and during her career in the teaching service she was an activist in Toronto’s Caribbean communities, volunteering with grassroots organisations to strengthen immigrant and women’s rights and to combat violence against women, drug abuse and poverty. In 1967, she served on the committee that helped organise the first Caribana festival, and in the mid-1990s she played a crucial role in establishing Black History Month in Canada. “The Caribbean Tourism Organisation’s Lifetime Achievement Award honours individuals who have made an outstanding contribution to society and who, by their example, have inspired at least one generation. Ms Augustine’s achievements have far exceeded those criteria,” the CTO said. Augustine promised to place the award in a fitting location where it can be seen and appreciated by members of the public. The honouree was introduced by her close friend Dr Rita Cox, who shared compelling stories of Augustine’s advocacy on behalf of the region and her dedication to teaching. “I invite everyone to take advantage of the opportunity to network and discover new and exciting ways to strengthen tourism ties between Ontario and the Caribbean. I would like to thank the Caribbean Tourism Organisation, its partners and volunteers for their commitment to a sustainable tourism industry that contributes to the well-being of the people of the Caribbean,” she stated. 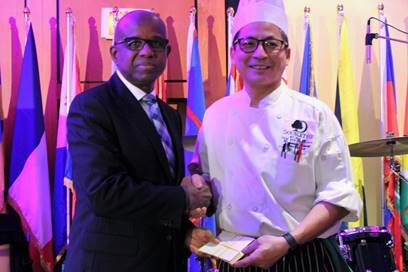 Organised by the CTO, Caribbean Week Canada 2017 combines business sessions and consumer-oriented events with Caribbean-inspired food, lively entertainment and networking opportunities.